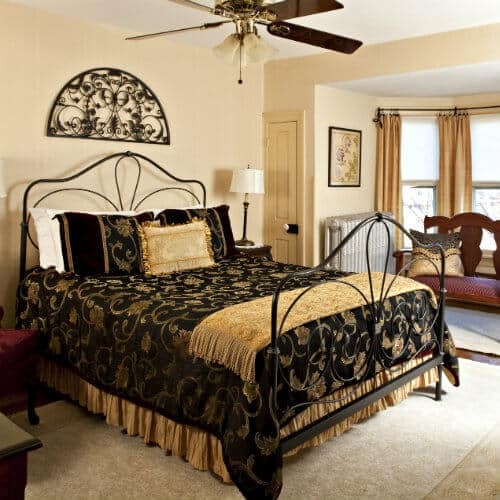 The Brickhouse Inn offers premier lodging in Gettysburg, PA that is second to none. All of the accommodations are created and outfitted with your comfort in mind. 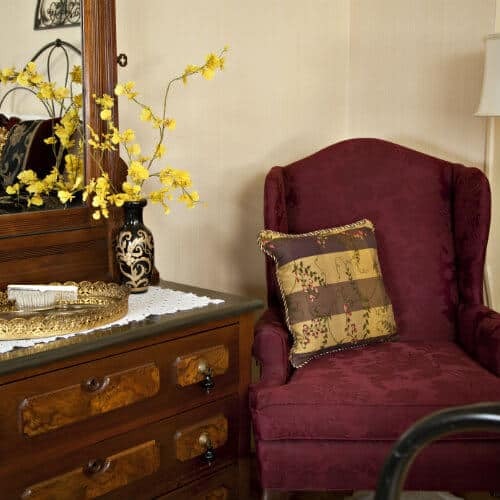 You will find yourself immersed in our area’s rich history as you relax in the comfort of your room. Named for states represented in the battle at Gettysburg, the guest rooms at the Brickhouse Inn were created and decorated to be comfortable. 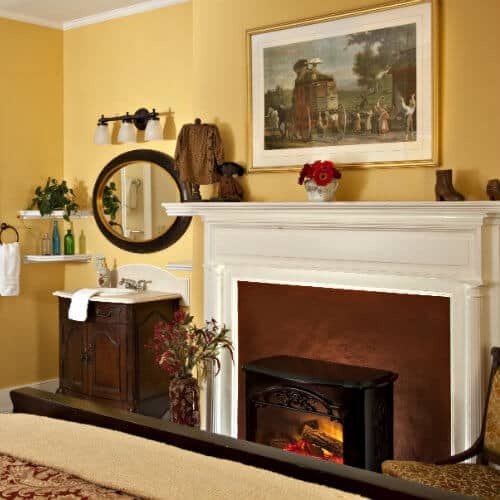 All rooms feature original wood floors and specially selected antiques and replicas. Queen-size beds are complemented by private bathrooms, ceiling fans and individually controlled mini-split heating and air-conditioning units. Every room has a TV set with satellite channels, and high-speed wireless Internet is available in all rooms and on the patios. 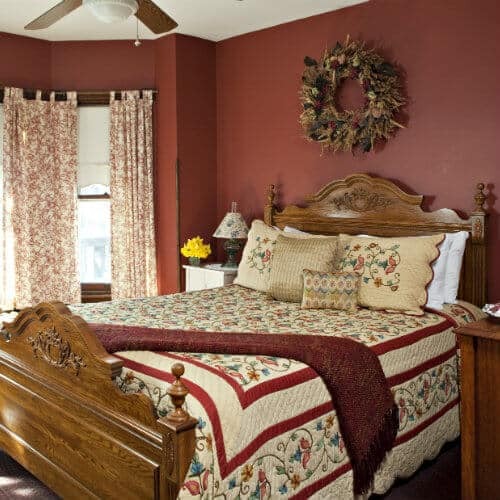 Choose a room with a bay window and a view of town, or a two-room suite with private porch and original claw-foot tub. 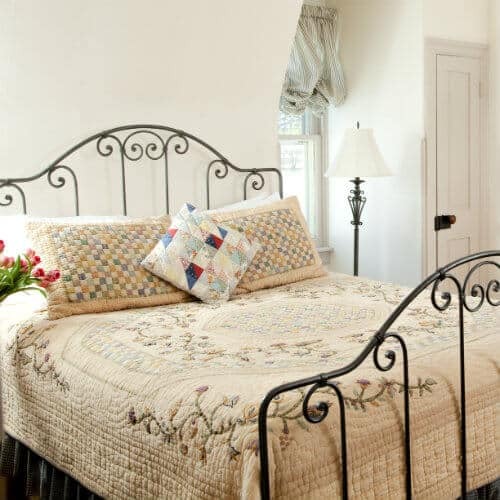 The Maryland Room is an ideal room for your Gettysburg vacation. It is located on the 2nd floor front of the 1898 Victorian house and has a bay window facing historic Baltimore Street. The room is furnished with an antique queen bed. 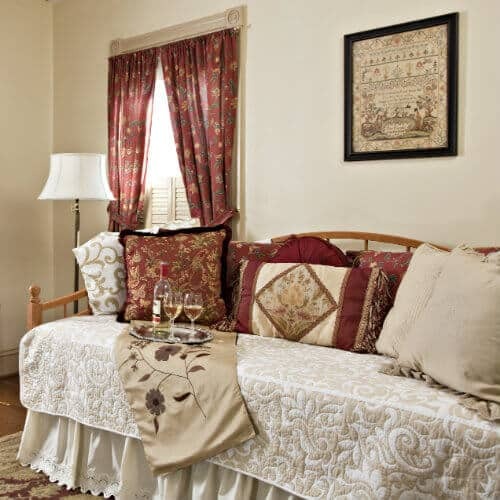 The rich sienna walls complement the antique furnishings and make for a romantic getaway weekend. Add one of our packages, such as the Sweetheart Package, which includes chocolate-dipped strawberries. Every morning indulge in our delicious three-course breakfast, made from the freshest local ingredients. Then, set off for the Gettysburg Visitor Center where you will find out more about the Battle of Gettysburg. In the summer, the room is cooled by a modern mini-split unit and ceiling fan; in winter, it is heated by the mini-split unit and a traditional radiator (with thermostat). The room is equipped with a small TV with satellite channels. The private bathroom has a standard tub with shower. A hair dryer is provided, and an iron and ironing board are available on request. 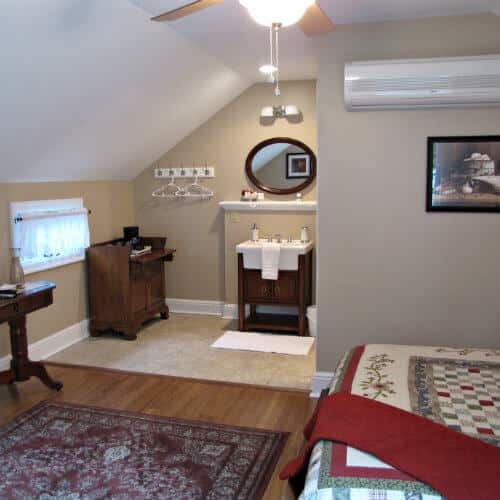 The perfect room to relax and enjoy the Gettysburg area. The New England Suite is on the 2nd floor rear of the 1898 Victorian house. The main bedroom has a reproduction antique wrought-iron and brass bed, complemented by a cherry dresser and chest of drawers. The small sitting room has a twin-size day bed, from under which a trundle bed can be pulled out to sleep a fourth guest. A door opens onto a private balcony porch. 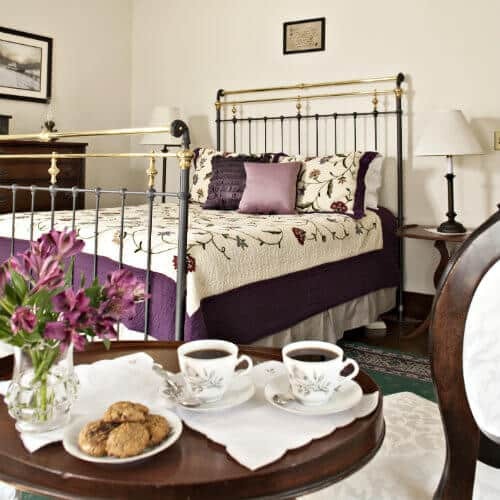 The New England Suite is a great room for girlfriends’ vacation getaways in Pennsylvania. 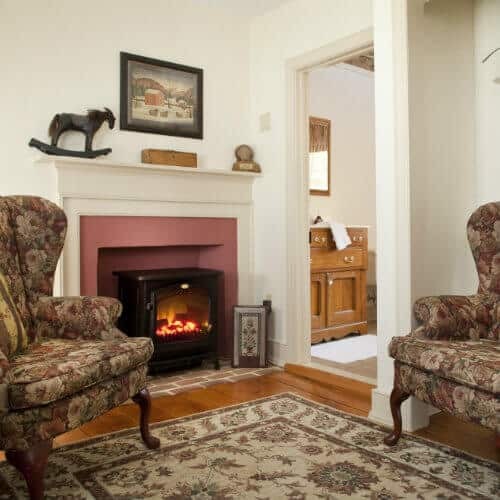 In the summer, the main room is cooled by a modern mini-split unit and a ceiling fan (the sitting room has a window air-conditioner); in winter, in addition to an electric fire (in the sitting room), it is heated by the mini-split unit and traditional radiators (with thermostats). The sitting room is equipped with a small TV with satellite channels. 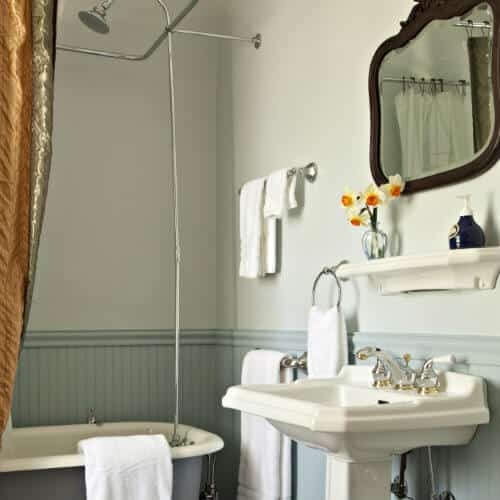 The private bathroom is between the two rooms and has an original claw-foot tub/shower. A hair dryer is provided, and an iron and ironing board are available on request. Vacation getaways in Gettysburg provide a wonderful way to relax, unwind and enjoy the rich history of the area. The New York Room is on the 3rd floor front of the 1898 Victorian house. This elegant room has a striking antique, wrought-iron queen bed, a green marble-top dresser, and a love seat in the bay window. There are many things to do in Gettysburg, including Battlefield tours, walks, and much more. In summer, the room is cooled with a modern mini-split unit and a ceiling fan. In winter, the room is warmed by the mini-split unit and a radiator with thermostat control. The room is equipped with a small TV with satellite channels. The private bathroom has a standard tub with shower; a hair dryer is provided. 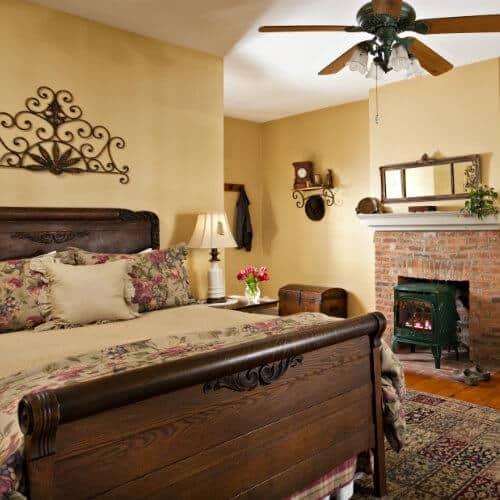 This is the perfect room for a Gettysburg honeymoon at the Brickhouse Inn. 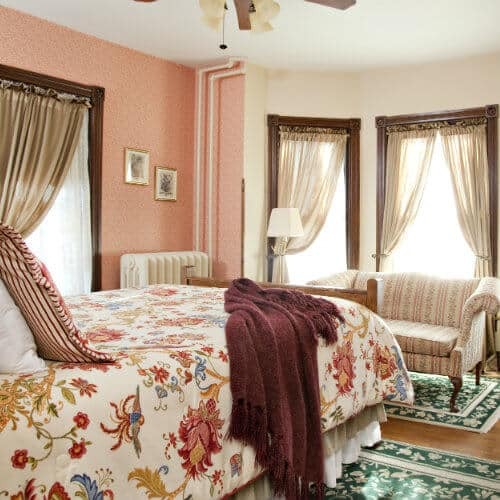 The North Carolina Suite is on the 2nd floor rear of the 1898 Victorian, ideal for a romantic Pennsylvania vacation. 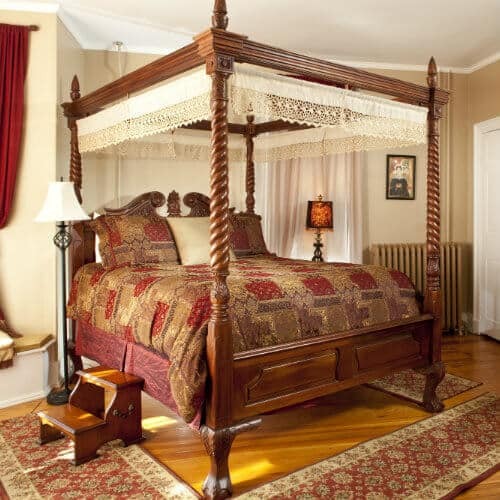 The main bedroom has a queen bed, complemented by beautiful antique furniture. The small sitting room has a twin-size day bed, and a rollaway cot can be added for a fourth guest. The private balcony porch with rockers and a splendid view over the garden is a peaceful spot to complete your day. In the summer, the main room is cooled by a modern mini-split unit (the sitting room has a window air-conditioner). In winter, in addition to an electric fire (in the sitting room), it is heated by a modern mini-split unit and traditional radiators (with thermostats). The sitting room is equipped with a small TV with satellite channels. The private bathroom is between the two rooms and has a rare stubby claw-foot tub/shower. A hair dryer is provided, and an iron and ironing board is available on request. 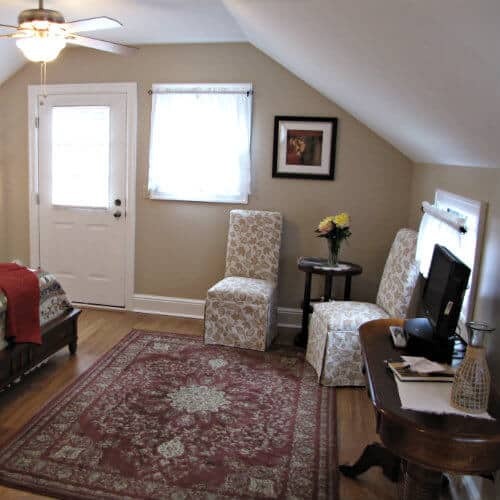 The Ohio Room is on the 3rd floor rear of the Victorian house, and has all the charm of stepping into Amish country. 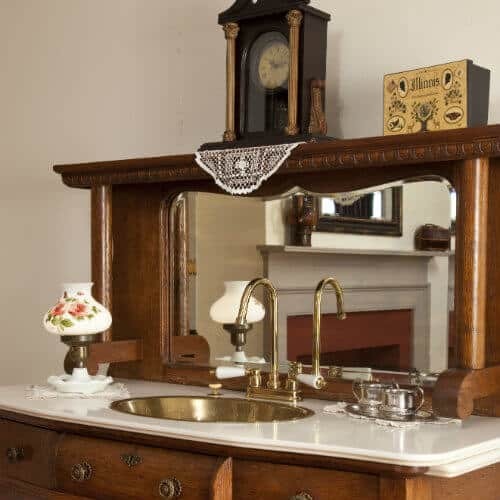 A wrought- iron queen bed is complemented by an antique oak dresser and washstand. A bright sunny room for a quiet retreat. In summer, the room is cooled with a modern mini-split unit and a ceiling fan. In winter, the room is warmed by the mini-split unit and a radiator with thermostat control. The room is equipped with a small TV with satellite channels. The private bathroom has a walk-in shower; a hair dryer is provided, and an iron and ironing board are available on request. 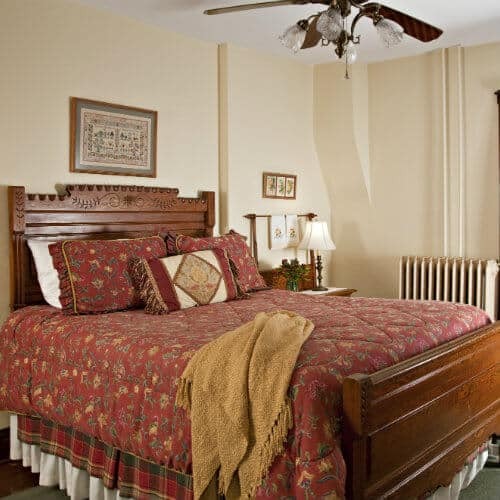 A perfect room to experience unique Gettysburg, PA lodging during your stay at the Brickhouse Inn. The South Carolina Room is on the 3rd floor front of the 1898 Victorian house. 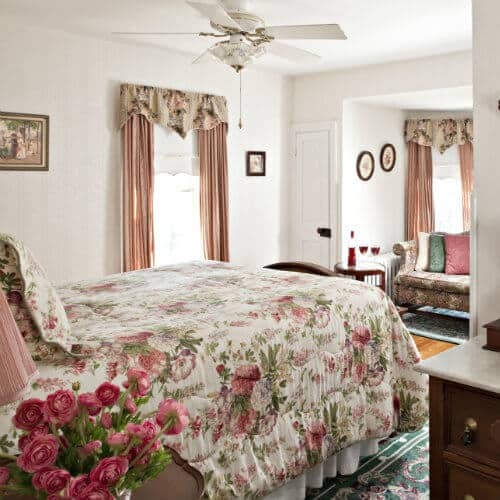 With subtle wallpaper in rose hues, this room has a true feeling of Southern charm. 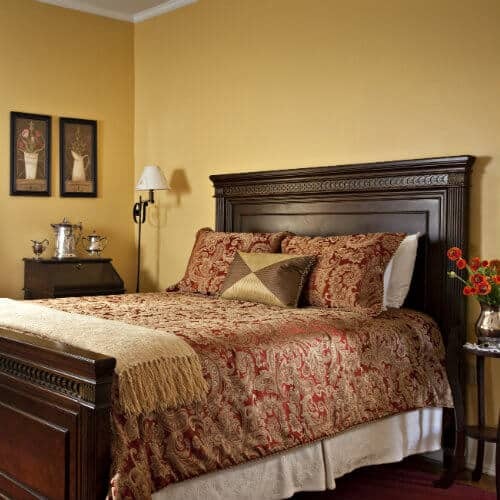 The room is furnished with a beautiful, antique maple headboard and a dresser with a marble top. The love seat in the bay window overlooking historic Baltimore Street is the perfect spot to plan your weekend getaway while enjoying one of our many special packages. In summer, the room is cooled with a modern mini-split unit and a ceiling fan. In winter, the room is warmed by the mini-split unit and a radiator with thermostat control. The room is equipped with a small TV with satellite channels. The private bathroom has a standard tub with shower; a hair dryer is provided. 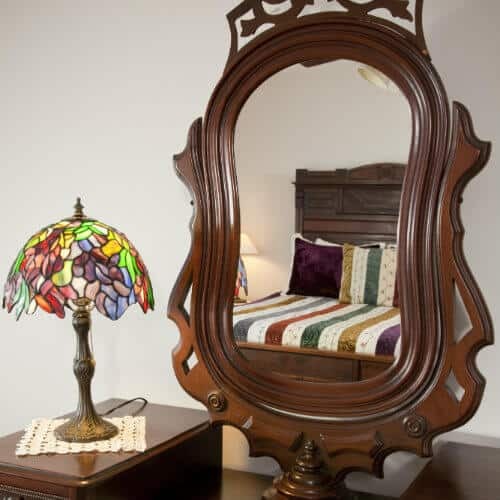 A charming alternative to hotel accommodations, the Tennessee Room is on the 2nd floor front of the 1898 Victorian house and has a bay window facing historic Baltimore Street. 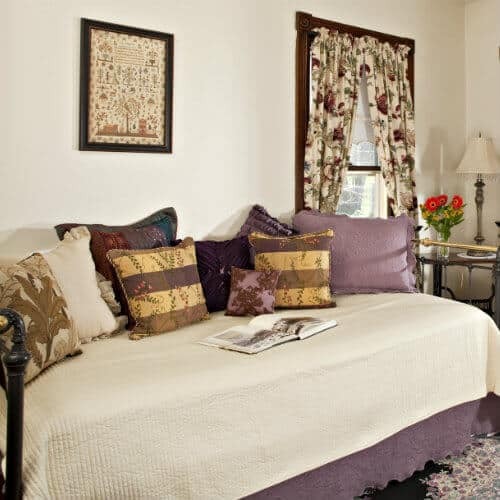 The room is furnished with an antique oak, high-back queen bed and a love seat in the bay window. This room is the perfect place to read and relax in an atmosphere of years long ago, but with today’s comforts. 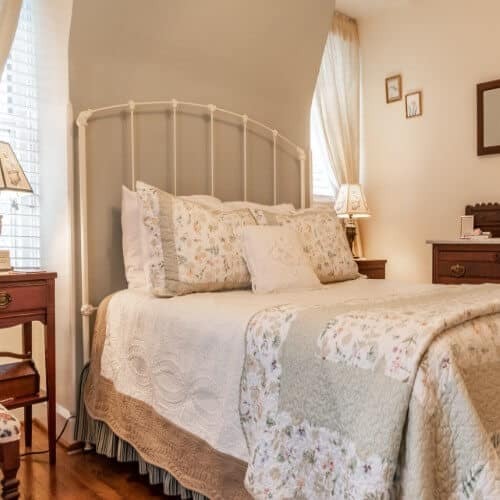 The lodging at our bed and breakfast is within easy range of other historic landmarks, including Antietam Battlefield and the Harpers Ferry area. A photograph on the wall shows it during the 1950s, when a couple spent their honeymoon in this room. In the summer, the room is cooled by a modern mini-split unit and ceiling fan. In winter, it is heated by the mini-split unit and a traditional radiator (with thermostat). The room is equipped with a small TV with satellite channels. The private bathroom has a walk-in shower. A hair dryer is provided, and an iron and ironing board are available on request. The Virginia Room is on the 3rd floor rear of the 1898 Victorian house. This room is small, but cozy, and it is ideal for the single guest. 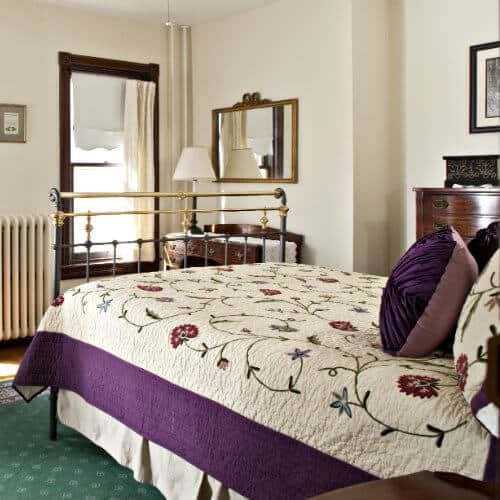 The room is furnished with an antique, marble-top dresser and side tables, and a wrought-iron double bed. In summer, the room is cooled with a modern mini-split unit and a ceiling fan. In winter, the room is warmed by the mini-split unit and a radiator with thermostat control. The room is equipped with a small TV with satellite channels. The private bathroom has a shower; a hair dryer is provided, and an iron and ironing board are available on request. The Alabama Room is on the 1st floor rear of the c.1830 historic Welty House, with a private entrance from a flower-lined brick patio. 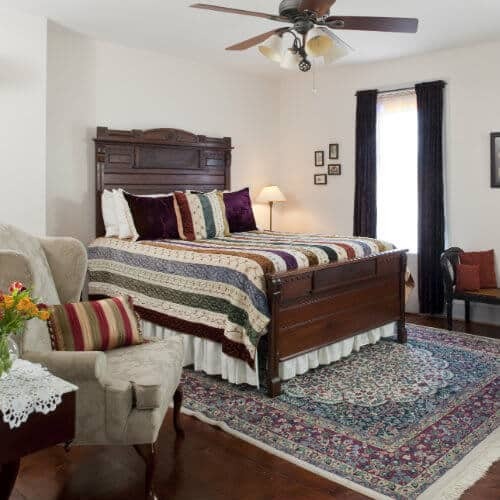 The room is furnished with a queen bed and still has the original floor boards and closet. 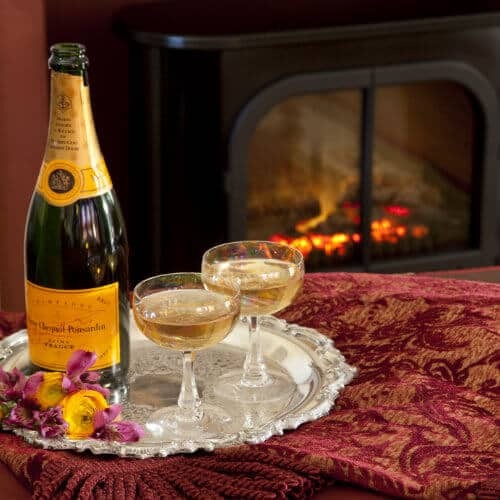 The fireplace has an electric fire, which creates a very cozy atmosphere. The room has easy access to the back patios, the garden, and ponds. Confederate soldiers occupied the house during the Battle of Gettysburg and the outer wall of this room still bears the scars caused by Union bullets fired from Cemetery Hill. 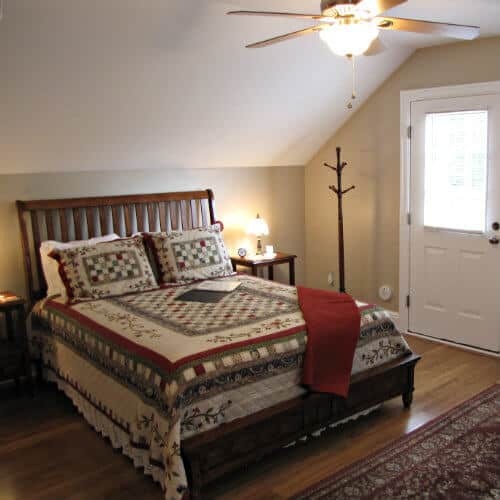 In the summer, the room is cooled by a modern mini-split unit and ceiling fan. In winter, in addition to the electric fire, it is heated by the mini-split unit and a traditional radiator (with thermostat). The room is equipped with a small TV with satellite channels. The private bathroom has a walk-in shower. A hair dryer is provided, and an iron and ironing board are available on request. 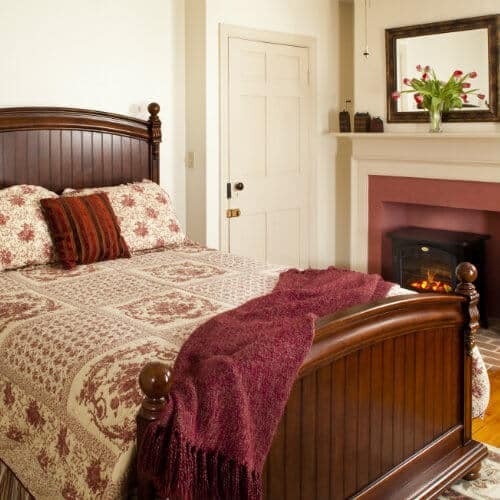 The Delaware Room is on the 1st floor front of the c.1830 historic Welty House, with original pine floors and furnished with an antique, tiger-oak queen bed and matching dresser. The front door opens onto a porch facing Baltimore Street, with rocking chairs where you can spend time watching the activities on the street. The rear door of the room opens onto a shady, tranquil, flower-lined brick patio, beyond which are the gardens and ponds. 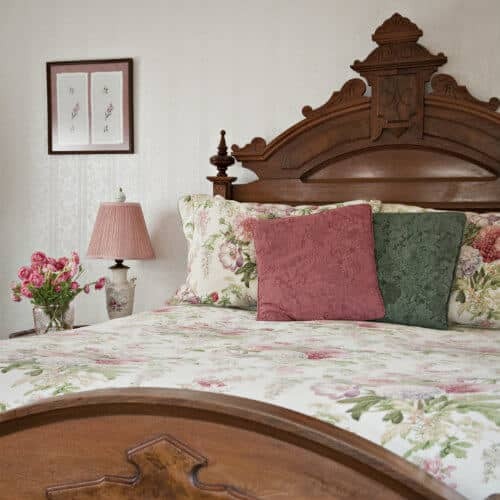 Our inn offers all of today’s modern amenities as well as the charm of a historic bed and breakfast. In the summer, the room is cooled by a modern mini-split unit and a ceiling fan. In winter, it is heated by the mini-split unit and a traditional radiator (with thermostat) as well as a cheerful gas-log fire. The room is equipped with a small TV with satellite channels. The private bathroom has an original claw-foot tub with shower. A hair dryer is provided, and an iron and ironing board are available on request. The spacious Georgia Room is on the 2nd floor front of the c.1830 historic Welty House, with windows looking out onto Baltimore Street. 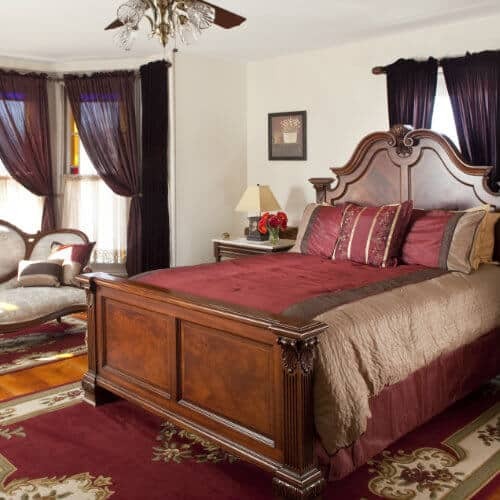 The room is furnished with an antique queen bed and dresser, and two comfortable wing-back chairs. The gas-log fire radiates a warm atmosphere on chilly nights. The private balcony porch looks out over the garden and ponds – a great place to relax in the rockers in the evening with your favorite wine, while you plan your activities, including walking tours in haunted Gettysburg and drives round the Battlefield. In the summer, the room is cooled by a modern mini-split unit and a ceiling fan. In winter, in addition to the gas-log fire, it is heated by the mini-split unit and a traditional radiator (with thermostat). The room is equipped with a small TV with satellite channels. The private bathroom has an original claw-foot tub with shower. A hair dryer is provided, and an iron and ironing board are available on request. 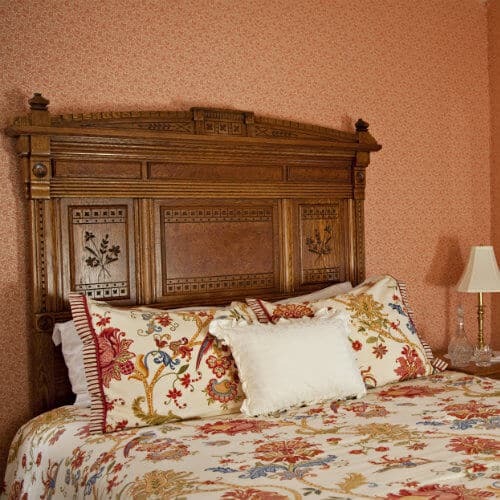 The spacious Illinois Room is on the 2nd floor front of the c.1830 historic Welty House, with a large bay window. The room is furnished with a queen bed, a love seat in the bay window, and an antique vanity with copper sink and marble top. The beautiful, original floorboards remain, complemented by stained glass window features. The fireplace now has a large Dimplex electric fire. From this room, you can look out over historic Baltimore Street, where President Lincoln rode past to deliver his famous speech at the dedication of the Soldier’s Cemetery. In the summer, the room is cooled by a modern mini-split unit and a ceiling fan. In winter, in addition to the electric fire, it is heated by the mini-split unit and a traditional radiator (with thermostat). The room is equipped with a small TV with satellite channels. The private bathroom has an original claw-foot tub with shower. A hair dryer is provided, and an iron and ironing board are available on request. 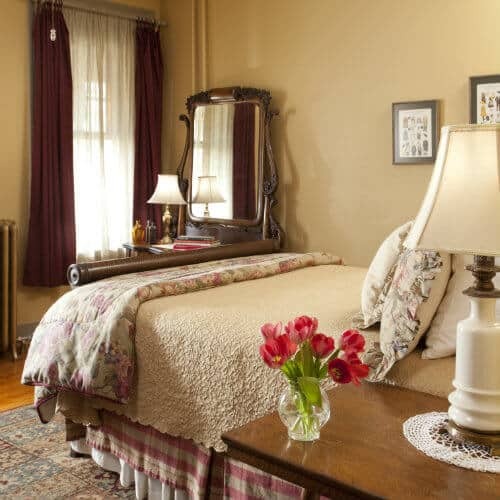 The spacious Kentucky Suite is on the 2nd floor rear of the c.1830 historic Welty House, an ideal room for a Gettysburg honeymoon or romantic getaway. The room is furnished with a queen bed and has a partly partitioned area with two comfortable wing-back chairs. There are fireplaces at each end of the suite with electric fires. The private balcony porch with rockers overlooks the garden and ponds. The porch wall has many bullet scars from the Battle of Gettysburg from Union gunfire at Confederate sharpshooters who occupied the house. This is a truly lovely room that reflects the history of the Battle. 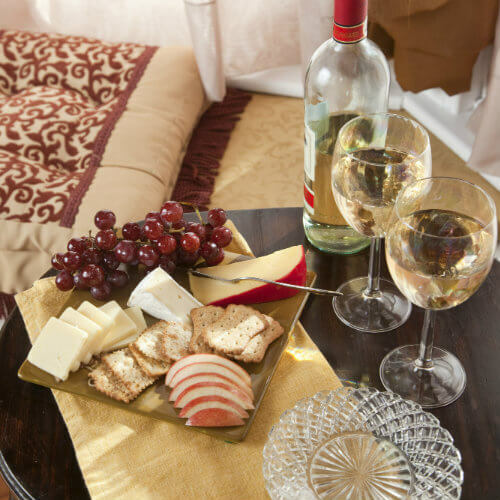 We also offer special packages that add an extra touch of romance to your time in Gettysburg. In the summer the room is cooled by a modern mini-split unit. In winter, in addition to the electric fires, it is heated the mini-split unit and by traditional radiators (with thermostats). The room is equipped with a small TV with satellite channels. The private bathroom has an original claw-foot tub with shower. A hair dryer is provided, and an iron and ironing board are available on request. The Texas Room is on the 1st floor front of the c.1830 historic Welty House – the original parlor of the Welty family. This romantic room is furnished with a grand, queen canopy bed. A large electric fire has been set into the original fireplace. The wide-plank pine floors and beautiful stained-glass windows are original features. 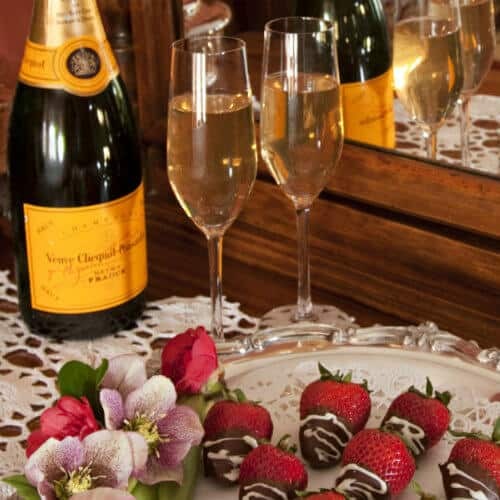 Romance your loved one with a Romance Package with chocolate-dipped strawberries and chilled wine. In the summer, the room is cooled by a modern mini-split unit and a ceiling fan. 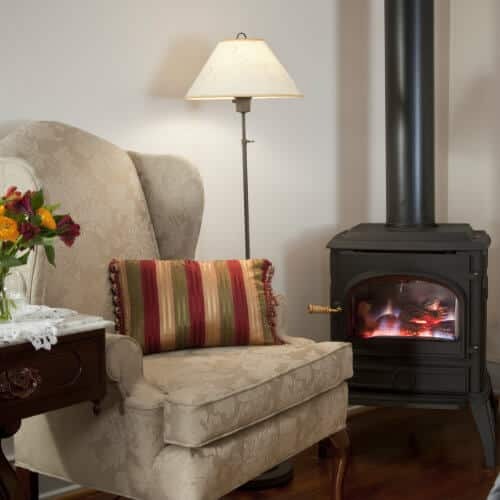 In winter, in addition to the electric fire, it is heated by the mini-split unit and a traditional radiator (with thermostat). The room is equipped with a small TV with satellite channels. The private bathroom has a walk-in shower. A hair dryer is provided, and an iron and ironing board are available on request. The Carriage House Room is on the 2nd floor of the modern carriage house, at the end of the garden, behind the Victorian house. It has a private entrance up a stairway from the garden, and can also be accessed (for luggage) from the main parking lot. 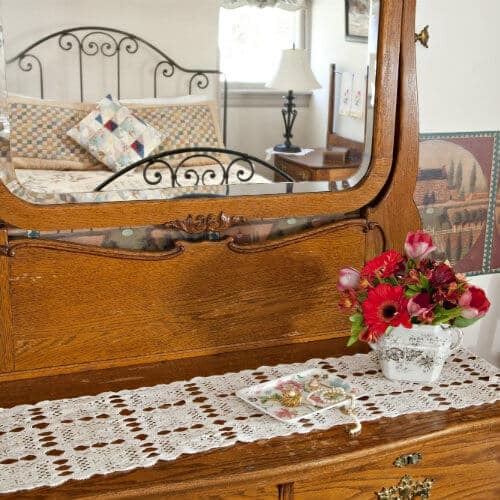 The room features a queen bed, two comfortable chairs, and an old ‘dry sink’. The Carriage House Room is very private and has easy access to the garden, water feature and patios. In the summer, the room is cooled by a ceiling fan, and modern air-conditioning unit with remote control, which also provides heat in winter. The room is equipped with a small TV with satellite channels. The private bathroom has a large walk-in shower. A hair dryer is provided, and an iron and ironing board are available on request.